Chelsea striker Nicolas Anelka offered a reminder of his striking prowess on Tuesday with both goals in a comfortable 2-0 win over FC Copenhagen in their Champions League last 16, first leg match. With 50 million ($80.95 million) striker Fernando Torres struggling and Didier Drogba warming the bench, the Frenchman made what looked like a testing trip to the Danish capital for out-of-form Chelsea into a comfortable night. In the other match, Real Madrid failed to beat Olympique Lyon yet again when the French side struck late to earn a 1-1 draw in a cagey Champions League match. He scored with carbon copy goals in each half at the Parken Stadium as Copenhagen, who held Barcelona there in the group phase, were brushed aside by Carlo Ancelotti's team who are firmly on track to reach the quarter-finals. "It was a good result and good performance," Ancelotti, who was under pressure after Chelsea's run of poor form, told Sky Sports. "The players worked hard and played good football but it is only the first half. "In this competition we are focused because we want to do well. Fernando Torres did very well because the key to the game was the work of the strikers," he added. Torres is still waiting for his first Chelsea goal since his deadline day move from Liverpool, although he did show signs of life before being substituted late on. Anelka, who missed a penalty in Chelsea's FA Cup exit in a shootout against Everton on Saturday, was razor sharp. When former Chelsea winger Jesper Gronkjaer gifted him possession in the 17th minute there was only one thing on the former France international's mind. Advancing towards goal he buried a right-foot shot low into the corner, giving goalkeeper Johan Wiland no chance. Without a competitive game since the beginning of December, FC Copenhagen struggled to find their rhythm and it took the introduction of Danish international Martin Vingaard for them to find their range in front of goal. He replaced Brazilian Cesar Santin at halftime and within 30 seconds he had registered their first shot on target. However, Anelka's second goal gave Chelsea breathing space and there was no way back for the Danes. Played in by Frank Lampard after 54 minutes, Anelka took aim and thrashed another shot past Wiland. With Chelsea in cruise control, Torres, given the nod in front of Drogba, nearly made it 3-0 with a neat turn and shot which brought a fine save from Wiland. Copenhagen searched for a way back into the tie without much conviction and Gronkjaer went down in the area vainly looking for a penalty, although he had already been flagged offside. Only Ajax Amsterdam have lost the opening leg at home and gone through in the Champions League knockout stages -- against Panathinaikos in the 1995/96 season -- and Copenhagen will be hard pressed to repeat that feat in the return on March 16. 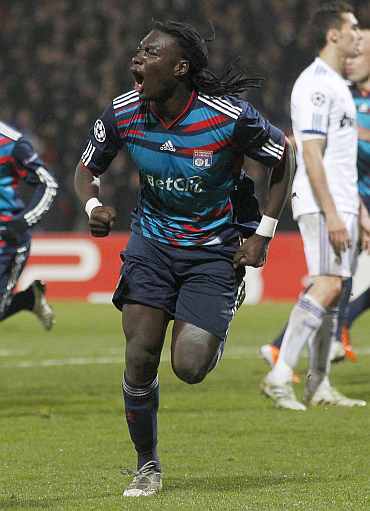 Real Madrid were denied a rare victory at Olympique Lyon when striker Bafetimbi Gomis struck late to earn his side a 1-1 draw in a cagey Champions League last-16 first-leg match. Real looked on course to end a run of three successive defeats at the Stade Gerland when substitute Karim Benzema scored with almost his first touch against his former club midway through the second half. But Lyon equalised seven minutes from time when the ball looped off a defender from a free kick straight to the unmarked Gomis who struck from close range. Despite conceding a late equaliser, Real look well placed to reach the quarter-finals after going out of the competition in the first knockout round in the last six seasons. "We got a useful and important result, finally putting an end to our bad run at this stadium," Real director general Jorge Valdano told Spanish television. "The team played very well and it was an authentic European match with a lot of intensity. "In the second half we could have run away with the game, including the possible penalty, but we got a very favourable result in the end. "We have a team that inspires confidence, especially in the Bernabeu," he added. Lyon seized the early initiative with the lively Michel Bastos shooting over and Real rarely threatened until Cristiano Ronaldo's long-range free kick was pushed away by the diving Hugo Lloris. Gomis missed the best chance of the first half on 34 minutes when his shot was deflected over after Real goalkeeper Iker Casillas failed to hold Bastos's cross on a damp surface after persistent rain. The hosts, roared on by their noisy fans in the famous Virage Nord stand, had other chances but Real hit the post earliy in the second half from Ronaldo's dipping free kick from out wide and Sergio Ramos rattled the bar with a header from a corner. The visitors also had a big shout for a penalty turned down before Benzema, cheered by Lyon fans as he came on, struck. Lyon rarely threatened to get back into the match but they struck from nowhere when a hopeful free kick from just inside the Real half took a huge deflection and fell kindly for Gomis who volleyed the ball crisply into the net as the Spaniards appealed vainly for off side. The second leg takes place at the Bernabeu on March 16.